Microsoft announced a new partnership that will allow Xbox 360 owners to access Amazon's massive selection of streaming video content from their gaming consoles. With an Xbox Live Gold account ($60 annually) and an Amazon Prime membership ($79 per year), Xbox 360 users can hop on the console's free Amazon Instant Video app and access more than 17,000 streaming movies and TV shows. Buying and renting videos on demand is currently not supported from the Xbox 360 app itself, users without an Amazon Prime membership can purchase one of the 100,000-plus streaming movies and TV shows by visiting Amazon.com/instantvideo. Once purchased, the videos appear instantly on the Xbox 360 app's Watch List. Amazon offers one-month free trials of Amazon Prime for users who'd like to try the service out. Amazon's Instant Video service streams new episodes of many popular shows the day after they air, and the entire selection is now available on the Xbox 360. The Amazon Instant app is also compatible with the Xbox 360's optional Kinect peripheral, a sensor-equipped device that allows users to control video selection and playback with arm gestures and voice commands. What's more, the Xbox 360's Amazon Instant Video app can work in tandem with Amazon's Kindle Fire tablet. The devices will remember video playback positions, making it easy to switch between them for portable or living room viewing. The Amazon Instant Video app is free to download, and it's now displayed prominently on the Xbox 360's "Apps" tab, just a button press (or gesture or voice command for Kinect users) away. Will the videos stream in HD? Amazon's UK streaming service Lovefilm just announced a multi-year streaming deal with Universal, a partnership that will further fuel the war between Netflix and Lovefilm that's already spawned several other exclusive deals in the UK. 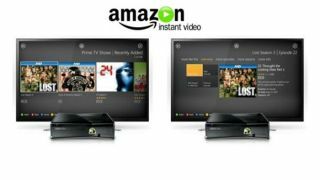 Lovefilm videos will be streaming in 720p, and an Amazon spokesperson confirmed to TechRadar via email that Amazon Instant videos streaming to the Xbox 360 in the US are available in full HD. The Amazon Instant Video App brought free Amazon Prime content and paid on-demand movies and TV shows to the Sony's PlayStation 3 in April, but this is the first time the app has been available on the Xbox 360.